Every year, more than 1,000 tornados touch down in the United States, causing millions of dollars in damage and scattering the victim’s personal treasures over miles of ground. A surprising number of ICF homes have sustained direct hits from tornados, and all of them have stood up to the pounding very well. Tornadoes are far and away the most devastating disasters to challenge home owners in North America. They are about four times more destructive than hurricanes or earthquakes. And yet it is not at all technically difficult to design and construct homes that will stand up to these monster winds. And they can be built for approximately the same cost as wood-framed houses. Can a structure survive an EF-4 or 5 tornado without damage? The answer is an emphatic yes, if they are built as reinforced concrete shells. A disaster-resistant concrete shell must have an integral reinforced concrete roof, detailed as a diaphragm in order to maximize the potential strength of the shell structure. Such a roof connects all of the walls together into a three-dimensional box. This usually takes the form of a cast-in-place structurally reinforced concrete diaphragm slab roof, but precast concrete panels can also be used. The use of insulated concrete forms (ICFs) make it possible to obtain any practical level of energy conservation required by contemporary building codes. Case Study #1 — Attica, Ks. 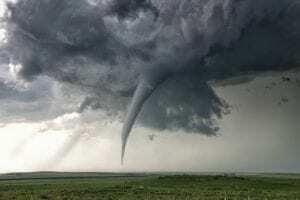 Randy and Linda Robbins, who live on the outskirts of Attica, Kan., had only a few moments to prepare for the tornado that suddenly dropped from the sky in May 2004. “We’d been looking through our window watching the storm,” says Linda, “when suddenly the front door blew open.” The couple raced toward the basement of their newly constructed home, built with ECO-Block ICFs, and prepared for the worst. An F-3 tornado tore the roof off this Kansas ICF home, but the walls stood strong and saved the life of the owner. The dramatic encounter, caught on film by a professional storm chaser, can be viewed on our website, www.icfmag.com. The home of Monte Asbury, pastor of New Oaks Church in Washington, Iowa, was less than a year old when disaster struck. On the night of May 15, 1998, he and his wife, along with their 7-year-old son, returned from a short trip to find their neighborhood covered in debris and swarming with police officers. An F-3 tornado with winds up to 200 mph had touched down there only two hours earlier, and many homes on the street were completely destroyed. The Asburys’ first concern was for their two children—Hannah, age 16 and Ben, age 12—whom they had left at home. They were relieved to find their children safe and their house almost intact. The two teenagers had waited out the storm in a windowless section of the basement, and reportedly experienced nothing more than their ears popping. “They said it felt like their ears were being sucked out of their heads,” says Rev. Asbury. Although the Asbury house was in the direct path of the tornado, it suffered minimal damage. The 6-in.-thick ICF walls, builtwith iForm from Reward Wall, had prevented most of the damage to the home. Most of the damage was caused by a huge tree that snapped in the storm and fell onto the roof. While several roof trusses were damaged and pushed aside, the roof of the house remained intact because the builder had secured it to the walls with hurricane clips. “Our roof framer installed the hurricane clips just because he thought it was the right thing to do,” said Asbury. “We probably would have lost the entire roof without the hurricane straps. The contractor who helped build the house said he was absolutely certain a wood wall would have been crushed by the tree that fell.” The only other visible damage was a garage door that had buckled under the tremendous air pressure. From where Asbury sits in his office, he can look out the window and see six bare foundations between the church and his house one block away. “Several people have come up to say, ‘I’ll bet you’re glad you built a concrete house.’ If I had more time I would be selling Reward houses here,” he says. A safe room is a structure within a larger building designed to protect occupants from the ferocious winds and flying debris of tornados and hurricanes. They typically are made entirely of concrete—floor, walls, and ceilings—with a sturdy steel door that opens into the room—so debris can’t block it. Jim Smith, superintendent of the Elmore City-Pernell School District in Central Oklahoma, made sure ICFs were used to construct a tornado safe room for the local high school. FEMA provided financial assistance that covered a significant portion of the cost. More of a “safe building” than a single room, the stand-alone structure has space for 200 students, restroom facilities, and other amenities. Built from Logix ICFs, it supports a post-tensioned concrete roof, a full 8 inches thick, created with Lite-Deck. 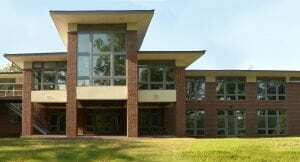 Administrators were so impressed with the structure’s strength that when the elementary school needed more space, they insisted on building a “safe room wing” from ICFs. The 12-classroom, 15,000-sq. ft. elementary addition has steel safe room doors and a concrete roof similar to the high school. This saferoom built for an Oklahoma high school, uses ICF for the walls and roof. The Federal Emergency Management Agency (FEMA) publication 320, titled Taking Shelter from the Storm: Building a Safe Room Inside Your House, has plans for a simple safe room. The booklet is available for free, and can be downloaded from their website. A link at www.icfmag.com will take you there. For a customized safe room, The National Storm Shelter Association (NSSA) has developed an industry standard for shelters. The NSSA standard provides specific guidance on underground shelters not available in FEMA publications. Financial assistance is available. Local, state and federal government agencies as well as other organizations offer grants, loans and tax incentives to owners and builders who build disaster-safe structures. Case Study #3 — Stoughton, WI. The durability of ICFs was proven yet again when an F-3 tornado tore through Stoughton, Wisconsin on August 18th, 2005. A total of 45 homes were leveled or sustained moderate to severe damage in the immediate area. Flying debris is the primary cause of injury and death during tornadoes and hurricanes. This storm was so severe debris from the neighborhood was found 75 miles away in Milwaukee. An ICF home, also built with Reward, was nearing completion when the storm hit. Boyd Coleman, a structural engineer, was called in to assess the damage. 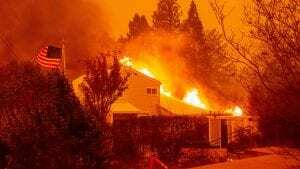 “Although I’m familiar with ICF construction, this was the first I had seen of an ICF building that had gone through something like this,” Coleman said. “I was surprised to see so much debris stuck in the foam.” One photo shows a 2×4 stuck in the foam stopped by the reinforced concrete. “We lost the roof of the garage and screened-in porch, and all the windows were broken,” says homebuilder Randy Settersten of Settersten Builders. Still, he estimates that progress will be back to where it was the day before the storm within two to four weeks from the date of the storm. Reward Wall Systems is offering a $1 per-form discount to those who rebuild in the wake of hurricanes or tonados. Visit www.rewardwalls.com for details. Case Study #4 & 5 — Oklahoma City, Ok.
On May 20 of this year, an EF5 tornado touched down just south of Oklahoma City. With winds estimated at 210 miles per hour, it stayed on the ground for 39 minutes, churning a 17-mile path of destruction through the heavily populated suburbs of Newcastle and Moore. At its widest, the tornado’s vortex was 1.3 miles wide as it demolished homes, businesses, and sadly, two elementary schools. Witnesses said the tornado more closely resembled “a giant black wall of destruction” than a typical twister. An estimated 1,150 homes were destroyed, with 23 deaths and an additional 377 injuries. Faye and Art began construction on their dream home back in 2002. Built with Reward’s 11” iForm (with a monolithic 6” core), the couple moved into their home two years later. Located on a large acreage lot on the east end of 149th Street, the estate also included a swimming pool and a stick-frame barn for Faye’s 11 horses and three cats. Homeowners (from left) Art and Faye, along with ICF homebuilder Bill R. stand in front of what remains of their home after being pummelled by 200+ mph winds. This same neighborhood was hit by a major tornado in 1999, and as the two-story house has no basement, Faye and Art built an ICF “safe room” with a concrete roof just off the kitchen behind a sturdy steel door for emergencies. As it happened, neither was home when the tornado touched down around 3 p.m. Although the acreage was slightly east of the worst damage, officials told the owners the twister was already an EF5 at the time it hit their property. The media later dubbed the area the “149th Street corridor of destruction.” All the neighboring houses were reduced to rubble. The twister obliterated Faye’s barn and sadly, all the livestock as well. The house itself lost its wood-framed roof. But while the interior was severely damaged, and several exterior walls resemble pincushions of wind-blown debris, the ICF walls remained structurally sound and the ICF saferoom (including the saferoom roof) were virtually unscathed. As a bonus, over most of the past 10 years, the home operated with a 50% energy savings. Kenny’s ICF home was built back in 2000 with Reward’s now-obsolete 9 ¼” waffle-grid eForm. The system has 6” diameter columns and beams every 16” on center; in between them, the concrete is only 2.5” thick. Waffle grids are a rarity now, pushed out of the market by the simplicity of flat wall ICFs. On the afternoon of the tornado, Kenny was sleeping—he works graveyard shifts—and was awakened by the tornado sirens. He turned on the television for information, only to find live footage of the tornado touching down only three miles away! He immediately took shelter in his safe room, built with four ICF walls, a concrete roof, and a storm-resistant metal door. Within 5 to 10 minutes, the deafening roar of the tornado made it clear the twister was directly on top of him. “I felt pretty confident while I was inside,” he says, “but then the storm just kept churning.” As the mile-wide vortex slowly made its way over Kenny, he could hear—amidst the roar of the wind—the windows exploding, and the sickening sound of the roof peeling off. The storm eventually moved on, and after agonizing minutes of stillness, he opened the door. “I came out and most of my house was open to the sky,” he says. The surrounding neighborhood was gone. The brick veneer exterior of his home had disappeared as well. Ravaged by an F5 tornado, this home protected its occupant despite being severely damaged, as these before-and-after pictures show. The intensity of the wind defies belief. The roof had been attached to the ICF walls with an anchor bolted rim joist. “In many areas the wood rim joist pulled through the top of the anchor bolts,” reports Doerr, the Reward engineer. Electrical cables were pulled from their runs, leaving the outlets deeply recessed in the wall. The attached garage and detached shop had been built with light-gauge metal studs, and were completely destroyed. Their contents (lawn mower, jet skis, cars, and boat) were found a quarter mile away. The window bucks, a vinyl system called V-Buck, held up very well. In fact, despite its dramatic appearance, the shell of the house is still structurally sound. Kenny plans on stripping out the interior, repairing the foam on the ICF walls and rebuilding the rest.